Sunday - Noory did his one Sunday of the month with Dr. Steve Haltwanger. They talked about the body electric. I didn't listen much to this and so I don't feel I should say anything about it. Monday - Noory welcomed one of my favorite guests, Steve Quayle. Quayle was mostly all about giants, though he did get into the terrorism topic as well. I probably will download this one and listen again since I miss a few parts. Tuesday - The Intelligent Design Roundtable, starring Richard C. Hoagland, Mike Heiser and Stan Tenen. My big disappointment of the week. I found this show dry and boring. Hoagie was the one in control and that did not help anything. Quite possibly this would have been a better show if Hoagie had been replaced with Marshall Klarfeld or someone else. I may be suffering from Hoagie burn out. Wednesday - Ed Dames showed up the first hour bringing with him his continuous predictions of doom and gloom and somewhat hyping a pay per view special with him and Noory. Then Will Hart talking about Atlantis and quite a bit about Hyperdimensional physics. I didn't get to hear this entire show, but what I heard was entertaining enough that I plan on downloading and listening to the entire thing. Thursday - Shipwrecks and haunted lighthouses was the topic with guest Mark Gumbinger. Not quite the show I had hoped for, but nonetheless a solid, good show. Friday - Morgus showed up for open lines. I wish I could say he improved the normal doldrums of it, but he didn't. Saturday - Ian Punnett returns to take the c2c abuse. First hour he welcomed Captain Kelly Sweeney to talk about pirates, modern day ones anyhow. The rest of the show was Michael Horn tooting the Billy Meier horn. I am not a big believer in the Billy Meier stories, but still this was a OK show. My favorite show of the week - Monday night with Steve Quayle was easily my favorite show of the week, though I have to say that all and all it wasn't a bad week. I have never heard or heard of Noory..do you have a link? 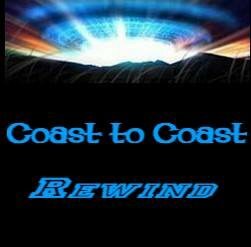 http://www.coasttocoastam.com or you can click the coast to coast with george noory button link in the side bar.